After Hina Rabani khar was selected as the foreign minister of Pakistan she is the topic of every talk show in Pakistan,Yes there is no denying the fact that She is beautiful and talented but she is no match for those 80year old ministers that have the experience that equals her age. Hina Rabbani khar showed her property to the election commission of Pakistan which was 1.35crore. Pakistani rupees,and she told that she don't have a car,can u imagine a property of 1.35 crore without a car? Hina Rabbani khar on her visit to India dressed her self beautifully as on aired by many Indian channels as a "Modal".but on the other side they also disclosed the prices of her jewelry,handbag,glasses,shoes and earrings.According to Pakistani media the price of her handbag was 7lack rupees but Indian media told that the price of that handbag was actually 35,00000Rs. 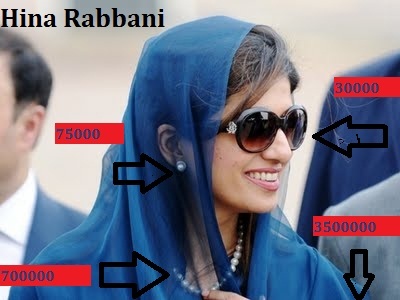 .This proves a very simple thing that a super luxury car is worth a handbag of Hina Rabbani Khar. Our corrupt leaders are doing as much as they can to gather as much money as they can.They really don't care that this money belongs to the people of Pakistan, not them. On the last visit of our president zardari to England he stayed at the royal suit in England,the price of royal suit in England for one night is 10,00000. When you have such corrupt, dishonest, self-centred criminals pretending to be leaders then the population has no one to blame but themselves for allowing the election of such scums as their leaders. There is no hope for a nation when the military has their dirty fingers in majority of the economic pie. To get a semblance of some credibilty Pakistan seriously needs to forcefully remove those corrupt tentacles; form stronger political opposition parties; change the model of business ownership; demand, implement and monitor transparency at all levels; and remove corruption at all levels through naming and shaming the people and organisations who are guilty of such behaviour. The name Pakistan is synonymous with failed state and unless the electors take drastic measures to remove these criminals they might as well resign their fate to a future of uncertainty. Good luck and you will need more. I don't believe it will happen as the problems of Pakistan are now indelibly intertwined in its DNA.